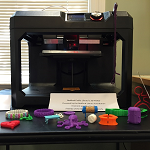 The Bedford Public Library has a Makerbot Replicator 5th Generation 3D Printer, generously donated by the Bedford Library Foundation. The PLA filament printing material is generously provided by the Friends of the Bedford Public Library. To have an object printed, please email a completed 3D printing form to reference@bedfordnh.org, along with a link to the Thingiverse design you would like printed. If you designed your own object, please send the appropriate file (our printer can accept .stl, .obj, or .thing formats). Printing costs 20 cents per gram. Cost is based on the weight of the finished object, including any rafts or supports provided in the software, when necessary for successful printing. We can estimate the cost for you before printing--please include this request in your initial email. We will let you know when your project has been printed and is ready for pickup, and what the final cost is. All objects must print in less than ten hours and fit within our printer's build area. If you're not sure, send us the file and we will check with the 3D printing preparation software. We do not print during weekend hours and there may be a queue of projects, so we cannot guarantee that a project will be completed by a certain date. Please let us know if you have a time constraint. Please call the library at 472-2300 or email reference@bedfordnh.org if you have questions.